Some people get the wrong impression about the cost of prepping. They assume it must cost a small fortune to buy enough supplies to survive a disaster. And although it can definitely add up, it doesn’t cost much to get started. 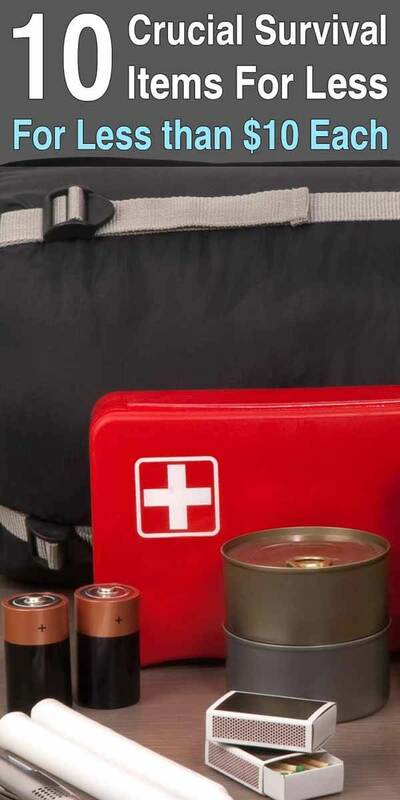 Most of the essential survival items can be purchased for less than ten bucks. Disclaimer: The items in this list were less than $10 at the time of this writing, but the prices may have changed. An absolute must for every bug out bag. Eight tablets can purify a gallon of water in about 30 minutes, killing bacteria, viruses, and giardia. In addition, the taste-neutralizing tablets get rid of the bad taste. You can buy them in bulk or get a single bottle of 50 tablets for under 10 bucks. Bic lighters are cheap, durable, and long-lasting. You can get one for around a dollar or two, or you can buy them in bulk and save some money. I recommend keeping several lighters in each bug out bag, in your car, in your desk at work, and in a drawer at home. These are a nice backup to your lighters. The stick is used to create a spark to start a fire and can be reused over and over. You should always have two ways to start a fire: the quick and easy way, and a way that isn’t going to run out or become empty. However, they do wear out over time. Be sure to keep one in every bag. You’ll need a way to see after the sun goes down, especially if you have things to do. There are many different options, but one of the best ways to light up the room is with liquid paraffin candles. They’re safe, bright, and burn without producing any smoke or odor. Many of them will last over 100 hours. Although candles are good for lighting up a room, they’re not good for travelling atraveling searching for things. Don’t go for just your average Walmart flashlight. Get a high-quality light you can count on. You’re also going to need a way to cook your food after the SHTF. There are plenty of backpacking stoves that only weigh a few ounces yet are durable and can cook up a small meal quickly. These aren’t just for keeping you dry in the rain. You can lay them on the ground so you don’t get wet, make a quick shelter, make a sling, and many other things. It is crucial to your health that you stay dry, especially in cold weather. Ponchos are inexpensive and some are going to be rather flimsy, but they’re still effective. These have a variety of uses. They do vary in thickness a bit, but they’re all pretty flimsy. Even so, they can help you stay warm, block the sun, gather water, and much more. And best of all, they cost less than a dollar each. 9. Paracord – Yet another survival item with multiple uses. Although it’s very thin, paracord is strong enough to hold hundreds of pounds. You can use it to build a shelter, pull somebody out of a hole, drag something heavy back to your camp, and so forth. The possibilities are endless. Last but not least, a good knife is a prepper’s best friend. As I showed in this post, knives have many important functions. Although you can get a decent folding knife for less than $10, eventually you’ll want to get a high-quality fixed blade knife with a full tang as well. For the knives you cant get much better than Mora or Hultafors for their prices, good steel with a pretty good length tang, if you need something tougher both Bahco and Mora have heavy duty knives at affordable prices. Magnesium sticks; I think you mean ferro rods. They make sparks. Magnesium is another animal. It’s a flammable metal. You cut some shavings off and light them with your ferro rod. It burns HOT and should light any tinder you have. I use some really good fire strikers from “the friendly swede” Magnesium alloy block with ferro rod attached, bought a pack of three on amazon uk for less than 10GBp. I would also add toilet paper on this list.